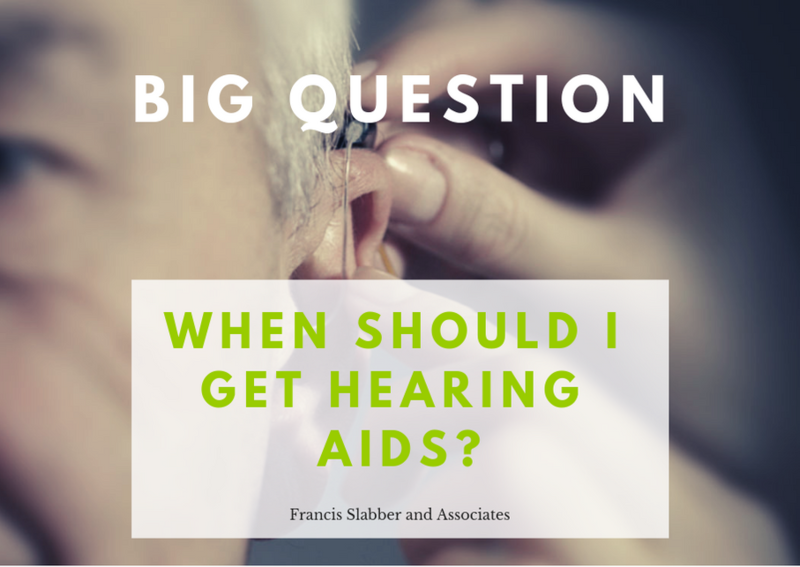 When should I get hearing aids? We all know that early intervention is important when dealing with children. A child with hearing loss that is identified and receives treatment early in life (before 6 months old) has a far greater chance of developing in a similar way to a child with normal hearing than one that is only diagnosed when they are older. But is early intervention something that is only important for children? What about adults? When is the right time to manage your hearing loss? When it comes to hearing loss that develops later in life, early intervention is also important. Sadly, many people believe that you only need to manage your hearing loss when you truly can no longer hear, but this is certainly not true. The earlier hearing loss is identified, and the earlier the person receives appropriate management such as hearing aids, the better. When one’s hearing begins to deteriorate, we often don’t notice it at first. It usually happens so slowly and gradually, that it can take years before you become aware of a problem. Throughout this time, the auditory nerve is starting to receive a degraded signal. Once a person notices a change in hearing, it takes, on average, 7 years before that person seeks help. Over this time the auditory nerve is being under stimulated and the brain begins to use compensatory strategies to cope with hearing. Our brains begin working harder and harder to hear and understand what is being said, and the signal coming in becomes progressively poorer and poorer. The longer we wait to diagnose hearing loss and increase access to sound, the more damage takes place in the auditory pathway due to under stimulation. If we are able to identify and treat hearing loss earlier, we are able to provide a better signal to the auditory nerve, and increase ease of listening, reducing the amount of energy used by the brain for hearing, before too much deterioration can take place. The more residual hearing an individual has, the better hearing aids will be able to supplement this hearing and provide natural, clear sound. In addition, the shorter the length of time without sound, the quicker and easier it is to adjust to hearing aids and get the most possible benefit from them. For all of these reasons, we suggest regular hearing testing and the fitting of hearing aids, if appropriate, as early as possible. All this said, there are times when it can be too early to fit hearing aids. It’s important to have your hearing tested comprehensively and to discuss your hearing experiences and lifestyle with a trained audiologist to find out whether this is the right time for you. If you have never had a hearing test before, a screening can be a good first step to find out whether further testing is needed, but if you suspect that you might have hearing loss, you will get more information and management recommendations from a full diagnostic assessment. For more information, or to book a hearing assessment, contact us or comment below.